You know, those days wherein you definitely woke up at the right side of the bed and instead of grumbling and slowly dragging yourself to get ready, you spring right up and out of bed, full of energy and ready for a fun new day to start. All throughout the day, you're still running like an Energizer bunny with that same smile plastered on your face. No amount of negative vibes can pull you down, you're on top of your game and you're loving it. That was me a few Thursday ago. So, let me continue to tell you what happened after that. After work, I rushed off to Traders Hotel Singapore to meet up with fellow bloggers as we were to feast on..CRABS. There you go, the major reason why I was such in a good mood that day. All day long, images of those juicy crab claws keeps coming to my mind and as the hours go by, all the more excited I got. 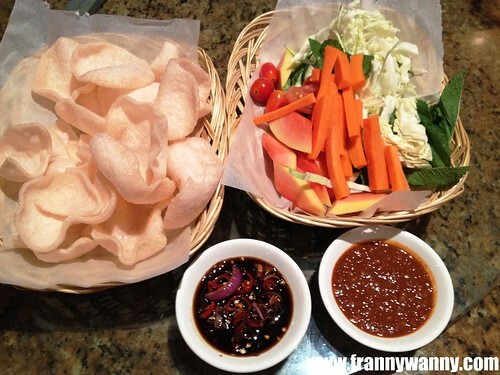 Our dinner began with a basket of prawn crackers or keropok as what it's locally called. Together with it came two spicy dipping sauce -- one was a soy sauce-chili padi mix and another was a fiery sambal sauce. The sambal was way to spicy for me so I happily played it safe with the soy sauce/chili padi one. We also had some fresh veggie sticks should you want a healthier option. 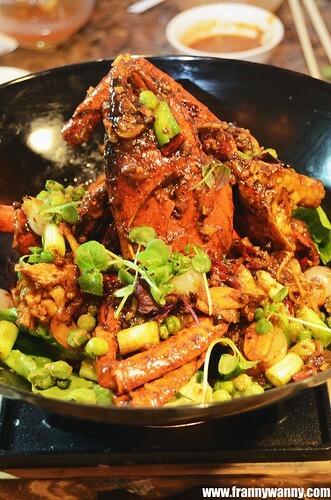 Ah Hoi's Kitchen has been one of our favorite restaurants as it serves the yummiest local dishes in town. 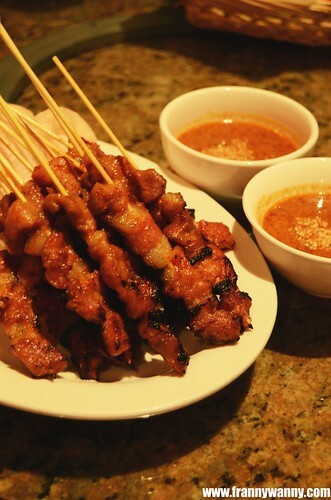 One of our favorites is the Singaporean Pork Satay which was grilled perfectly keeping the pork so juicy and sweet. Served with a bowl of peanut sauce, this definitely is the best way to start your meal with. Remember, we were there to feast on crabs but before the stars of the night came to our table, we were blown away by the next dish -- Mixed Grilled Meat on a Wooden Board. This was just PERFECT. Sitting by the pool, listening to the sound of water splashing, the comforting aroma of the cool evening breeze and water and yes, a huge serving of all the best grilled items in front of you. I'm such a lucky girl! 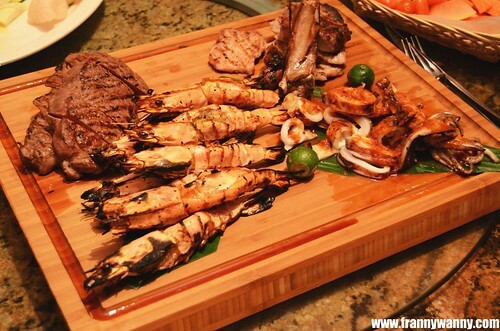 We enjoyed a variety of Grilled Prawns, Squid (Sotong), Beef and Black Kurobuta Pork. My favorite was the tender kurobuta pork which you can easily bite into and still look very poised and ladylike while doing so. 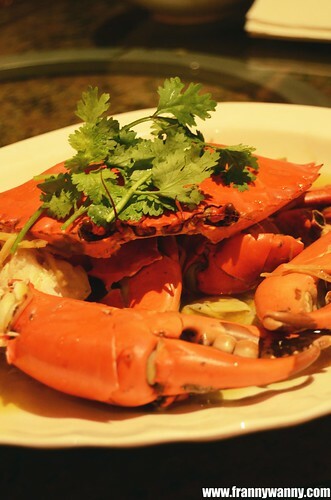 In line with Ah Hoi Kitchen's Crab Festival wherein they will be showcasing 12 interesting crab dishes for patrons to try. That evening, we were to try 4 crab dishes that evening. Yes, FOUR. I guess, I wasn't the only one excited about it as everyone in the table came prepared for the crab battle and just for extra measures, we were given a cloth bib and lots of wet napkins to save our shirts and dresses from being crabby stained. 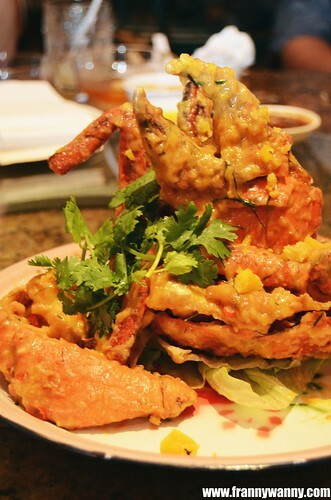 The 12 crab dishes were divided into 3 menus which will be released one after the other. Here they are! Our first crab was the Steamed Crab cooked in ginger and Chinese wine. If you ask me, my favorite crab variant is steamed as I like the clean, fresh taste which normally gets masked when served otherwise. This is the true test of how fresh the crab is. The meat easily falls off the shell, it was indeed very juicy and I could taste the sweet ginger that was included in the broth. So delicious! It was indeed very simple but definitely very flavorful. Our second crab was a surprise favorite of mine. Okay, one reason why I also love steamed crabs is that it's not oily. I am not a fan of eating with my hands so the less oily it is, the better. However, upon smelling the delicious aroma of the Crab Beehoon, I couldn't help but dig in. 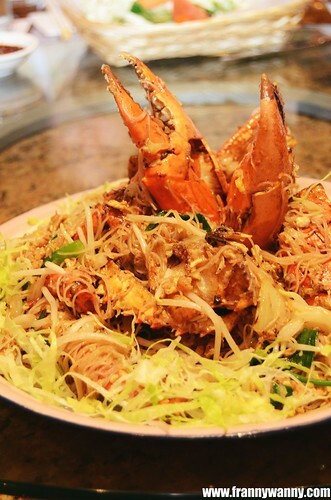 The vermicelli noodles was cooked al dente and stir-fried with crab meat, sun-dried shrimps and veggies. It was very addicting and delicious! Aside from getting a giant crab claw, I had two servings of the noodles too! Come to think of it, since my birthday is coming up in two weeks, maybe I should go back to Ah Hoi's to have another Crab Beehoon for long life :). Before moving to our 3rd crab, we're all asked if we still have room for two more. Of course, everyone gave their thumbs up sign. We're all food lovers after all! That signaled the kitchen to bring out the Salted Egg Crab which reminded me of the one that I had a few months back. This was pretty good but I'd love for it to be creamier with a stronger salted egg flavor. I'm also not a fan of the salted egg bits that covers the crab giving it a powdery texture. The last crab dish is definitely not for the faint-hearted..or at least those with very low spicy tolerance like myself. Served in a beautiful black wok, the Prickly Piquant Crab is cooked with szechuan peppers, pickled garlic and citrus salt. It smells amazingly good but Paul just gave me a small serving of the crab meat to taste and that was enough to set my tongue on fire! Well, I have been warned given the name and the ingredients that was cooked with it. I dare all spicy lovers to go for this and tell me what you think! To tame all burning tongues, we cooled down with some of Ah Hoi's Kitchen's signature desserts. Paul chose the Chendol which is Singapore's version of the Filipino halo-halo. 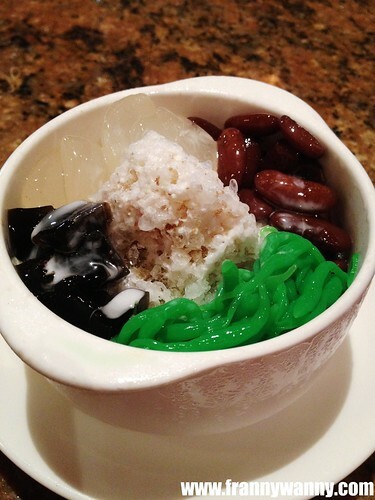 Crushed ice mixed with a combination of green jelly noodles, coconut milk, red beans and more. He loves this very much and commented that this was definitely a perfect way to end his delicious crab dinner. 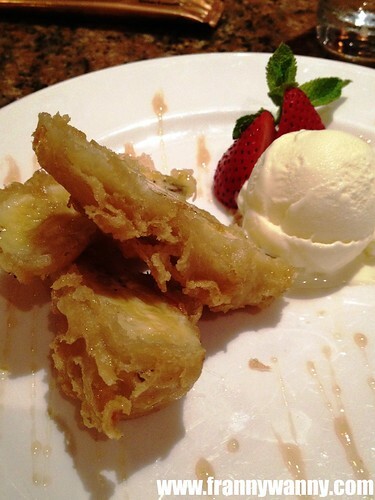 As for me, I went for my childhood dessert favorite -- Goreng Pisang with Ice Cream. It's deep-fried banana fritters coated with caramel syrup and served with a scoop of vanilla ice cream. It's a simple dessert but it surely brought back a lot of nice childhood memories. Once again, another delicious dinner at Ah Hoi's Kitchen. We all enjoyed the juicy and really flavorful Sri Lankan crabs which are flown-in direct from Sri Lanka on a regular basis. Crabs weighing up to 1KG are priced at S$7.20/100g while the bigger ones from 1KG and up are priced at S$9.20/100g. Just to share, there were 9 of us that evening and we had a mix of 1KG - 1.5KG crabs to feast on. Now, you know why I truly had a good day. Check out Ah Hoi's Kitchen at the 4th level (Poolside) of Traders Hotel Singapore, 1A Custaden Road, 249716, Singapore. Call 6831-4373 to reserve.